Bone regeneration practice has evolved significantly by introduction of new diverse type of regeneration materials. Thus, practitioners’ comprehensive knowledge of regenerative material properties is one of the requirement for optimum clinical outcome. The aim of this review was to retrieve and analyze articles comparing the histological and radiological features of different grafting materials used in dentistry. The search for English articles published between January 1990 and June 2016 was done through Embase, PubMed and Scopus database to identify articles comparing histological and radiological features of different grafting materials used in dentistry for compilation and qualitative analysis. Most of the articles retrieved had low level of evidence with methodological heterogeneity. With the limits of this review, the qualitative analysis of the selected papers draws the following conclusions: Most of the materials investigated showed satisfactory bone regeneration capability. When properly prepared ABG is the best grafting material in terms of new bone formation, local tissue reaction and rate of material resorption. There is limited evidence that some synthetic BRMs have similar to or even better osteoconductive properties than autograft. Calcium phosphate cement (CPC) has restricted osteoconductivity capability. Autologous bone graft has been used for a long time as the only material capable of osteogenesis, osteoinductive and osteoconductive in regeneration medicine. However, revolutionary discoveries have introduced a wide range of bone regeneration materials (BRMs) with improved characteristics, comparable to those of the gold standard (autograft). Thus, the determination of the product for optimal clinical outcome has been a challenging process requiring comprehensive knowledge on properties of the available BRMs. Based on the available literature, most BRMs have demonstrated very high success rate in treating various clinical conditions in all areas of dental practices . Nevertheless, some variations exist between different regeneration materials that call for thorough understanding of material characteristics before utilizing them in various clinical conditions. The knowledge of physical, chemical and biological characteristics of BRMs available for clinical practice is prime in material selection for optimum clinical outcome. While some bone substitutes undergo almost immediate biodegradation and resorption, others can be detected on the implant site for several years [2,3]. Some materials are reported to have better osteointegration with host bone . Ideally, osteogenesis, osteoinduction and osteoconduction are the three essential elements of bone regeneration along with the bonding between host bones and grafting material which is called osteointegration . Bone grafting materials can be classified based on their source (eg. autograft and allograft), chemical composition (eg. calcium phosphate) and physical properties (eg. Ceramic). A mixture of materials (eg. synthetic and autografts) has also been widely applied in contemporary dental practice [6,7]. Table 1 shows the different type of materials categorized based on their sources and composition. Table 1. Types of bone graft materials with examples of commercially available brands. The objective of this review was to retrieve and analyze articles comparing histological and radiological features of different grafting materials used in dentistry, in order to determine the BRMs with favorable characteristics regarding histological and/or radiological features in general, new bone formation, biocompatibility properties as well as the rate of biodegradation and resorption. The review team searched for articles comparing BRMs properties in vivo. The articles were supposed to be published in English language between January 1990 and June 2016. A search of articles from Embase, PubMed and Scopus database (February to June 2016) was conducted using the terms “guided bone regeneration”, “guided tissue regeneration”, “bone regeneration”, “bone grafts”, “bone augmentation”, “bone substitute”, “Bone replacement” as well as “Bone biomaterials” and “dental implants” along with “AND”, “OR” and “NOT” Boolean operators. The articles inclusion criteria were the use of two or more types of BRMs. Only clinical and in vivo animal experimental studies were included. The articles were required to compare the histological and/or radiological findings as a result of bone healing of artificial bone defects in animals as well as clinical management of human dentoalveolar conditions. We excluded abstracts without full articles, articles without clear comparative report between the grafting materials studied. In addition, all publications which compared individual grafting material (eg. β-TCP) to a material mixture (eg. β-TCP plus autologous bone chips or platelet-rich plasma) were also excluded. Due to the data extracted from the literature accessed, an explicit quality assessment was not performed. We initially identified 323 titles potentially relevant for the review from data base search. 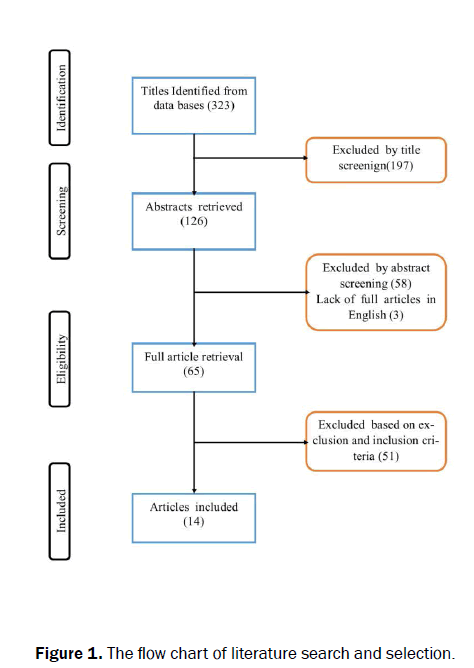 Based on literature search and screening strategy, only 61 full articles were retrieved, while 4 articles were acquired by requesting from authors, making a total of 65 full articles. With inclusion and exclusion criteria evaluation a total of 14 articles were finally selected for review analysis (Table 2). Figure 1 shows the flow of literature search. De Lange et al. DBBM v/s BCP. The BCP and DBBM materials showed similarity in Bone volume, graft volume, degree of bone mineralization, as well as osteoclast and osteocyte numbers. Signs of more active bone formation and remodeling were observed in BCP- than in DBA-grafted biopsies. Merli et al. DBBM v/s β- TCP Histomorphometrically: No significant differences were evident between the groups. Residual graft tended to be greater in the β-TCP group. Radiographic bone loss was significantly higher in DBBM than in β-TCP group. Hu et al. CSPC v/s CPC Residual graft materials: CSPC resorption was significantly higher than CPC. Jung et al. FDBA v/s DBBM + C Bone formation: DBB+C had less bone forming capacity and maintain space than DBBF. New bone formation: DFDBA demonstrated higher bone formation than DBBM but not at significant level. The Groups showed no difference in residual graft materials and tissue reaction. Takauti et al. DBBM v/s BCP BCP showed higher percentages of newly formed bone than DBBM, while the cavities with DBBM showed higher amount of residual graft. Shahoon et al. HBMG v/s ABG Tissue reaction: There was reduction of inflammation and an increase in new bone formation in both groups on 7, 14, 28 and 60 days after surgery. The giant inflammatory cells were consistently lower in ABG groups on 7 and 14 days. Bone formation with HBMG on day 24 was more than autograft. However, there was no significant difference between the groups on day 60. Rosa et al. MIC v/s HA v/s β- TCP Bone density (BD): No difference between groups one week after the implant. At 2, 3, and 6 weeks there was higher DB in the empty control than in the other groups. MIC and TCP had no difference in density but both groups showed a higher bone volume than HA 40 group. Table 2. The list of the reviewed articles with the key findings and the grafting materials assessed. Figure 1: The flow chart of literature search and selection. For analytical purpose, we used the generic categorization based on the origin and chemical composition of the BRMs to avoid the complex multitude of trade names used in original studies. The following are the types of BRMs analyzed: Autogenous Bone Graft (ABG), Hydroxyapatite (HA), Human Bone Matrix Gelatin (HBMG), Biphasic calcium phosphate (BCP), Demineralized freezedried bone allograft (DFDBA), Freeze-dried bone allograft (FDBA), Deproteinized bovine bone with collagen (DBBM + C), Calcium sulphate/phosphate cement (CSPC), Calcium phosphate cement (CPC), Polylactic and polyglycolic acid (PL/PG), Hydroxypropyl methylcellulose (HPMC), Silanized-HPMC (Si-HPMC), Microgranular hydroxylapatite (MIC) and Bioactive vitroceramic (BV). Among the 14 selected articles, only two were clinical trials [8,9]; the rest [10-21] were animal experimental studies (Table 2). In summary, BCP was compared to DBBM by three studies [8,10,11], DBBM was also compared to β-TCP and DFDBA [12,13]. Whereas Jung et al. compared DBBM+C and FDBA, ABG was compared with β-TCP, BMG, HBMG and BV [15-18]. Other studies assessed MIC, HA-40 and β-TCP . Luvizuto et al. investigated PL/PG gel, CPC, β-TCP, while CSCPC and CPC were studied by Hu et al. . Another research, by Bayat et al. compared BMG with ABG. Quantitative synthesis of the retrieved data was not appropriate due to the low level of evidence and methodological heterogeneity of the selected articles. Hence, only descriptive results are presented in this review. In general terms, PCP, ABG, BV, BMG, FDBA, DFDBA, β-TCP, DBBM, DBBM+C and MIC have demonstrated acceptable results in most studies (Table 2). Relatively many studies reported ABG to have better or equal performance compared to other BRMs in term of new bone formation [15,17], local tissue reaction [15-17,21] and rate of grafting materials resorption [15,17] (Table 2). The materials HBMG, BV and β-TCP were reported to have similar or even better osteoconductive properties than autograft [16,18]. Calcium phosphate cement (CPC) has restricted osteoconductivity capability and showed numerous multinucleated giant cells around the sites [15,20]. Two studies [9,10] favored BCP and β-TCP on vertical bone height and minimal bone loss respectively compared to DBBM (Table 2). Bone grafting practice has significantly evolved from relying solely on autologous bone blocks to inclusion of diverse synthetic regenerative materials. The emergence of new bone grafting options and alternatives has led to significant uncertainty when determining the most appropriate product for surgical procedures requiring bone graft . The articles involved in this review depict the current status of regeneration material diversity. The researchers are currently using autografts, allografts, xenografts and alloplast materials indiscriminately [10,13-16,18,19]. The variables assessed include new bone formation, resorption of regeneration material; local tissue reaction, as well as bone height gain and bone loss. The extent of new bone formation was the variable assessed by all studies included in this review. Majority of the regeneration materials (PCP, ABG, BV, BMG, FDBA, DFDBA, β-TCP, DBBM and MIC) have demonstrated acceptable results in most studies. The three studies recently published [8,10,11] have reported slightly higher percentage of new bone formation among BCP than DBBM groups, the difference was statistically significant in two studies [10,11]. Even Matsumoto et al. reported better new bone formation by BV (calcium phosphate based) than ABG. According to Wenisch et al. , the surface of tricalcium phosphate ceramic materials enhance material bonding with adjacent host bone, thus stimulating osteoclastic resorption and osteoblastic bone formation on the surface of and within the resorbed implant. Another striking finding of this review is that two studies [15,21] have reported β-TCP and BMG respectively to perform better in bone formation than ABG, even though the difference between β-TCP and ABG was not statistically significant. While ABG remains to be the gold standard grafting material because of its osteoconductive and osteoinductive properties as well as its osteoprogenitor cells content; the bone substitutes with optimum granule size porosity and biodegradation properties may outpace some ABG preparations in a number of clinical and histological aspects. The ABG clinical outcome is determined by the type of bone constituting the transplant (eg. cortical, cancellous or a blend of both) and the graft particle size . It is therefore, not surprising to have contradicting results when comparing ABG with other bone substitutes. Calcium phosphate cement (CPC) was reported not to support new bone formation except at the edges of the biomaterial . The same study also observed no difference in amount of new bone between PL/PG gel and empty control. Likewise, CPC showed poor regenerative quality, except when chemically modified to form a resorbable Calcium Sulphate/Phosphate Cement CSPC . The probable reason for this observation is the poor porosity of the material: Thus, requires multinucleated giant cells to phagocytize the biomaterial giving space for bone formation as it was previously speculated . The resorption profile of the materials determines the effectiveness of BRMs on clinical performance. Whilst almost all commercially available BRMs claim an appropriate resorption profile, several studies have reported differences in the resorption properties [2,24,25]. In our review, BCP showed higher rate of resorption compared to DBBM [10,11]. Previous study has reported bovine-derived hydroxyapatite, in a granular form to have a very slow resorption  and shows no evidence of resorption at twelve months . Calcium sulphate (CS) has relatively fast resorption of the synthetic grafting materials . Despite limited resorption rate for DBBM , Luvizuto et al. reported higher percentage of residual grafting materials in β-TCT than DBBM: Nonetheless, the difference was not statistically significant. When compared to DFDBA, DBBM showed no difference in percentage of residual grafting materials . The articles included in the review did not report the resorption rate of the ABG. However, studies have observed much slower incorporation in cortical than cancellous bone grafts due to their difference in structural compositions [27,28]. Biocompatibility is one of the prerequisite of an ideal bone grafting material. In this review five articles [13,15-18] reported about this parameter by the amount of inflammatory cells in the healing graft tissue. Four of the articles [15-18] confirmed the known fact of ABG being the most compatible grafting materials. When compared with β-TCP, CPC, PL/PG, BV, DBBM and HBMG, the researchers observed the least amount of inflammatory cells in the healing defects treated by ABG. Paknejad et al. found no difference in the amount of residual graft materials and local tissue reaction when compared DBBM and DFDBA. Depending on the indication of the regeneration treatment, the reliable horizontal and vertical bone gain may be the corner stone of success in various dental rehabilitation procedures. Hence, any biomaterial having these properties may be ideal for patients with severe alveolar bone resorption. Chakar et al. observed greater vertical bone height gain in the defects filled with BCP than with DBBM in animal experimental study. Merli et al. in a randomized clinical trial reported significantly higher radiographic bone loss among lesions treated by DBBM than those treated by β-TCP. The two studies favored BCP and β-TCP on vertical bone height and minimal bone loss respectively. If supported by more clinical studies, these materials may be among the choices for augmenting alveolar bone in dentistry. Unfortunately, literature with high evidence on this topic is very sparse; thus, the review included experimental studies. However, the article presents the status quo worth referencing in the limited scientific evidence available. It is also important to note that, for simplicity, the review considered the grafting materials in groups rather than individual brand product. The reader should be aware of the significant differences between individual substitute materials based on their variations in chemical compositions, granule size and porosity which have implications in the clinical performance of the materials. Most materials (PCP, ABG, BV, BMG, FDBA, DFDBA and MIC, β-TCP, DBBM as well as DBBM+C) have satisfactory bone regeneration capability. Autogenous bone graft (ABG) is superior to other BRMs in terms of new bone formation, local tissue reaction and rate of grafting materials resorption. There is low level evidence that BCP and β-TCP have similar to or even better osteoconductive properties than autograft. Calcium phosphate cement (CPC) has restricted osteoconductivity capability. Machibya FM, et al. Application of bone regeneration (br) in clinical orthodontics: the current status. RRJoD. 2016;7:21–31. Yildirim M, et al. Maxillary sinus augmentation using xenogenic bone substitute material Bio‐Oss® in combination with venous blood. Clin Oral Implan Res. 2000;11:217-229. Piattelli M, et al. Bone reactions to anorganic bovine bone (Bio-Oss) used in sinus augmentation procedures: a histologic long-term report of 20 cases in humans. Int J Oral Max Impl. 1999;14(6):835-840. Wenisch S, et al. In vivo mechanisms of hydroxyapatite ceramic degradation by osteoclasts: Fine structural microscopy. J. Biomedical Mater Res Part A 67A. 2003;713-718. Cypher TJ and Grossman JP. Biological principles of bone graft healing. J Foot Ankle Surg. 1996;35:413-417. Sheikh Z, et al. Bone replacement materials and techniques used for achieving vertical alveolar bone augmentation. Materials. 2015;8:2953-2993. Bashutski JD and Wang HL. Periodontal and endodontic regeneration. J Endod. 2009;35:321-328. De Lange GL, et al. Histomorphometric and micro–computed tomography study of bone regeneration in the maxillary sinus comparing biphasic calcium phosphate and deproteinized cancellous bovine bone in a human split-mouth model. Oral Surg Oral Med O. 2014;117:8-22. Merli M, et al. Membranes and bone substitutes in a one-stage procedure for horizontal bone augmentation: a histologic double-blind parallel randomized controlled trial. Int J Periodont Rest. 2015;35:463-471. Chakar C, et al. Vertical bone regeneration with deproteinised bovine bone mineral or biphasic calcium phosphate in the rabbit calvarium: effect of autologous platelet lysate. J Mater Sci-Mater M. 2015;26:1-9. Takauti CA, et al. Assessment of bone healing in rabbit calvaria grafted with three different biomaterials. Braz Dent J. 2014;25:379-384. Luvizuto ER, et al. Effect of recombinant PDGF-BB on bone formation in the presence of β-tricalcium phosphate and bovine bone mineral matrix: a pilot study in rat calvarial defects. BMC Oral Health. 2016;16:1. Paknejad M, et al. Histologic evaluation of bone healing capacity following application of inorganic bovine bone and a new allograft material in rabbit calvaria. J Dent. 2015;12:31. Jung GU, et al. Histomorphometric evaluation of onlay freeze-dried block bone and deproteinized bovine bone with collagen in rat. Tissue Eng Regen M. 2016;13:70-77. Luvizuto ER, et al. Osteoconductive properties of β-tricalcium phosphate matrix, polylactic and polyglycolic acid gel, and calcium phosphate cement in bone defects. J Craniofac Surg. 2012;23:e430-433. Matsumoto MA, et al. A novel bioactive vitroceramic presents similar biological responses as autogenous bone grafts. J Mater Sci-Mater M. 201;23:1447-1456. Olate S, et al. Comparison of bone graft healing between autogenous bone, blood clot and anorganic bovine bone matrix, radiographic and histological analyses. Int J Morphol. 2013;31:1257-1262. Shahoon H, et al. Comparison of the human bone matrix gelatin (HBMG) with autogenous bone graft in reconstruction of the parietal bone defects in rat: a histological and radiographic study. J Dent Res Dent Clin Dent Prospects. 2009;3:37-45. Rosa AL, et al. Hydroxylapatite and tricalcium phosphate implants in the dental alveolus of rats. A histometric study. Braz Dent J. 1995;6:103-109. Hu G, et al. Study on injectable and degradable cement of calcium sulphate and calcium phosphate for bone repair. J Mater Sci-Mater M. 2010;21:627-634. Bayat M, et al. A comparison of bone reconstruction following application of bone matrix gelatin and autogenous bone grafts to alveolar defects: an animal study. J Cranio Maxill Surg. 2010;38:288-292. Mathias P and Seigerman DA. The clinical use of allografts, demineralized bone matrices, synthetic bone graft substitutes and osteoinductive growth factors: a survey study. Hss: Journal, the Musculoskeletal Journal of Hospital for Special Surgery. 2005;1:9. Zaner DJ and Yukna RA. Particle size of periodontal bone grafting materials. J Periodontol. 1984;55:406–409. Beekmans HCS, et al. The hydroxylapatite–bone interface: 10 years after implant installation. Int J Oral Maxillofac Surg. 2008;37:768-772. Hughes E, et al. Inorganic cements for biomedical application: calcium phosphate, calcium sulphate and calcium silicate. Adv Appl Ceram. 2015;114:65-76. Lee Y, et al. Bone reaction to bovine hydroxyapatite for maxillary sinus floor augmentation: histologic results in humans. Int J Periodont Rest. 2006;26:471. Ray RD. Vascularization of bone grafts and implants. Clin Orthop. 1972;87:43–51. Delloye C, et al. Morphometric and physical investigations of segmental cortical bone autografts in canine ulnar defects. Clin Orthop. 1992;282:273–288.